The Betable Wallet is the first universal account for a new wave of real money gaming. One-time registration. One secure login. One balance. One loyalty system. One wallet across all the best games. 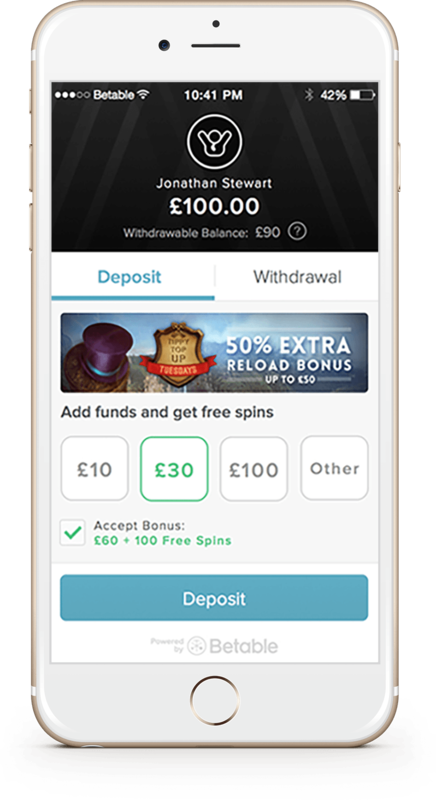 Players do not want hassle when depositing funds or getting their winnings. Betable Wallet offers leading payment options including Visa, Mastercard, Paypal, Neteller and Skrill as well as fast and secure deposits and withdrawals. We are licensed by the United Kingdom (UKGC). Player funds are kept in segregated bank accounts and monitored at all times. Players get a transparent wallet experience with visibility into cash and promotional balances and detailed transaction history. Our 24/7 dedicated and friendly customer support team helps with any issue a player may be having and we also offer tools so everyone can play safely. Wherever a player may be, whether at home or on-the-go, we deliver the best possible experience, making it easy to connect to their Betable Wallet anytime, anywhere. One login means network-wide promotions and bonuses a player can use in multiple casinos and apps. One login means a cross-network Loyalty Program that rewards play across sites and apps.